What if I told you there’s a way to boost the amount of email subscriptions you receive within minutes? Leadpages increased subscriptions by 60%, and many other companies are claiming 40% to 70% boosts in subscriptions. Well, it turns out two-step optin forms are making quite an impact, so it got us wondering why these are so effective. What’s a two-step optin you ask? In short, it’s a button or link on your website that users can click to reveal a lightbox popup form. 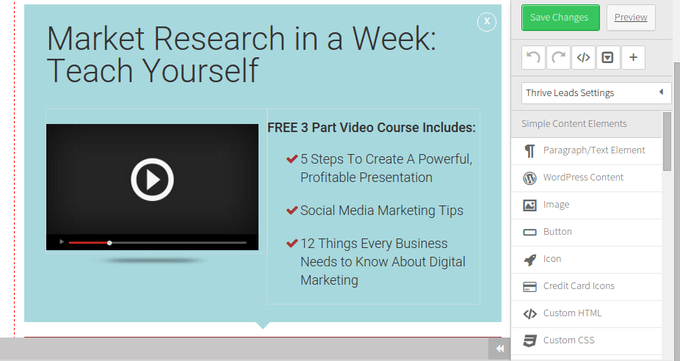 It only shows up when someone actually wants to see it, and the call to action text and buttons, combined with the quick signup forms, are apparently so effective that tons of big time bloggers (Like Pat Flynn and David Coleman) are already using it to increase their email lists. That’s where the Thrive plugin comes into play. This is one of the more recent solutions for setting up a two-step optin form, and it provides a wide set of other features for rapidly building your email list without the need for special coding skills. Since quite a few WordPress bloggers are singing their praised about Thrive Leads, we wanted to take a dive into the tool to understand if it’s what everyone says it is, and whether or not it’s the right email building plugin for you. We’ll outline the Thrive Leads functionality, ease of use, pricing and support, while also comparing it to other competitors such as OptinMonster, Magic Action Box and Plugmatter. 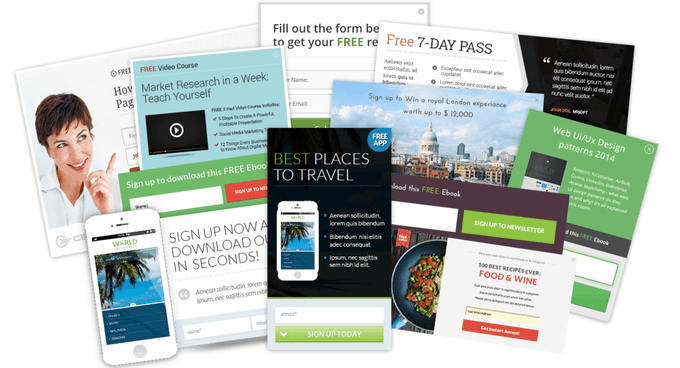 The main goal when working with Thrive leads is to install a plugin that prompts visitors to subscribe via an email form. You want the subscribe rates to increase because of the design, placement and overall efficiency of the plugin. At the same time, we’re looking for a wide set of features so you don’t end up paying for just one little optin form. Otherwise you’d be better off going with one of the many free plugin options. 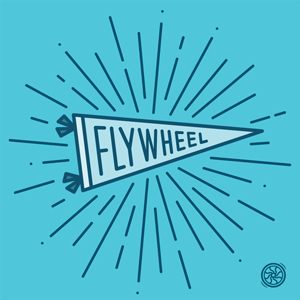 Each of your email subscription campaigns are called “Lead Groups,” so you can have several different types of forms for each group. For example, if you have a new book you’re trying to sell, you may have several landing pages, product pages, popups and blog posts for that same book. Each one of the pages and posts could have a module for collecting emails, and they would all be categorized under the same Lead Group. As you can see above, this “Alternative” Lead Group gives me options to customize and activate items like slide ins, lightboxes and ribbons. This seems a little confusing at first, but it’s best if you think of the lead groups as campaigns, where each campaign is dedicated towards one facet of your business. The campaign can have all sorts of forms, but it’s still one campaign. The reason I mention this in the drag and drop section is because this is where you can choose which optin forms you’d like to design. Click on the Edit button for any of them, and get to work. As an example, if I wanted to edit or design a slide in, I’d select that option and open the drag and drop editor. The editor is a little less modern looking than I expected, but all of the modules you need are to the right. Change around text, and insert items like buttons, credit card icons and images. They even have custom CSS and HTML modules for the more advanced developers. Overall, the customization options are plentiful, and since using the tool for about six months, I haven’t noticed anything finicky when moving around elements. The tool works perfectly for seeing whether a widget, slide-in or lightbox is best for a certain page, but it’s disappointing that the only testing allowed is inside each individual lead group. I’d like to see whether a simple button color change on my lightbox would make a difference, but from my knowledge you can only test between varying types of forms. So, you could pair up a lightbox versus a ribbon, but not necessarily a ribbon versus a ribbon. A huge benefit of going with Thrive Leads is you don’t need multiple plugins to achieve several tasks. That’s because they package all of the list building tools you’ll need into the same plugin. All of these work rather well, but I’d have to say my favorite is the two-step lightbox, since it has boosted conversions on my own site, and I like having that on the homepage, along with ribbons on other pages. 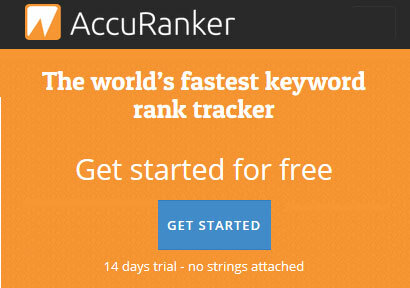 What are the list-building tools? Thrive Leads doesn’t exactly tell you how many prebuilt form templates are in the library, but I counted 10 in the screen filler lightbox category, so I would think all of the optin components have similar numbers. Regardless, the library has enough themes for you to figure out what you need. You can brand them how you want, but many of the templates are so pretty from the start that you might just consider changing the text and leaving everything else be. As with many plugins, the prebuilt elements make Thrive Leads standout the most. It’s clear the developers were thinking about both beginners and advanced users, since these templates truly expedite the design process. 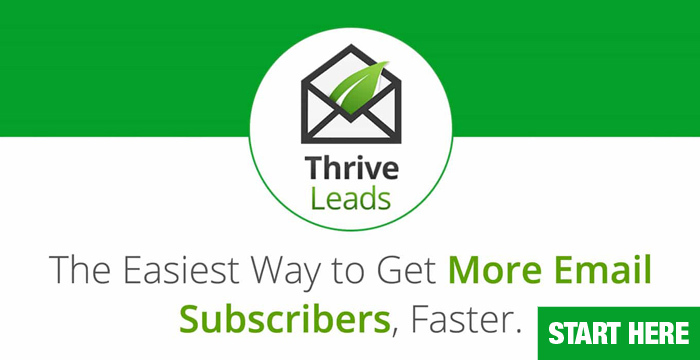 In terms of installing the Thrive Leads Plugin, it only takes a few minutes. You don’t have to touch any code to make things happen, and the plugin can be accessed from the left hand side of your dashboard, on the toolbar. A registration key needs to be punched into your dashboard, which adds a step for you, but this is just for the company to ensure you’re not using it on tons of sites that aren’t allowed. Your stats are shown on the dashboard, and managing one of your already set up lightboxes or optin forms is possible if you click on the primary Thrive Leads tab in WordPress. In my experience, some of the buttons are a little confusing, and it takes a bit to fully understand what the differences are between items like lightboxes, forms and widgets. One area that makes it much easier to implement forms and lightboxes is the shortcode generator. 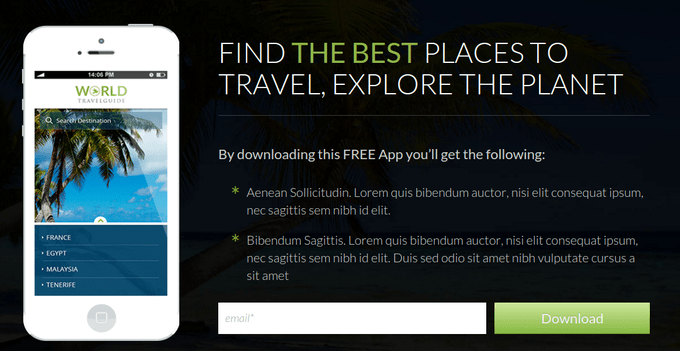 Essentially, shortcodes are little bits of code that you can place anywhere on your site. 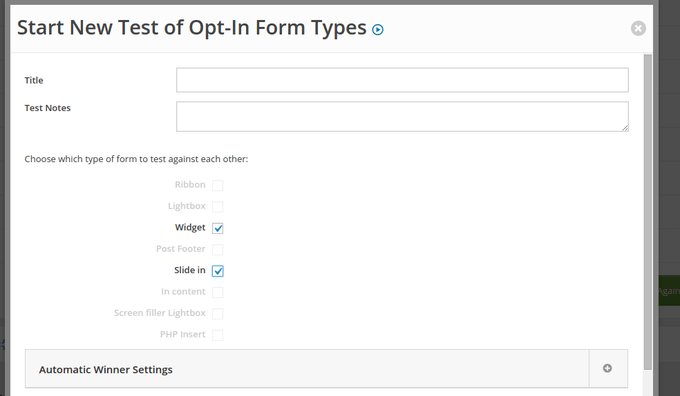 They work great if you spend a bunch of time designing an optin form, and you’d prefer if you didn’t have to do it again. So, you simply create a shortcode of that design, and place it on another post or page. Essentially, they work as templates for designs you’ve already worked on. Finally, upon installation you’ll see quite a few Thrive tabs in the toolbar. In my experience it’s far less confusing if plugin settings are consolidated into a single tab. Since Thrive gives you around five tabs, it clutters up your dashboard a little and forces you to second guess which of them needs to be clicked. Heck, they have a full tab just for the font manager. I feel like this could go somewhere in the general settings module. That said, the ease of use with Thrive Leads is pretty remarkable. The setup is faster than any of the competition, and the shortcodes empower you to make duplications of your designs, without having to touch any source code. Before its release, there was some speculation on how much the Thrive Leads system would cost users. Some figured it would be far out of their price range, especially compared to OptinMonster. Although the raw pricing for OptinMonster is lower in the single site plan, you’ll notice that OptinMonster charges its $49 per year, whereas Thrive Leads has a one-time price of $69, making it cheaper in the long run. Not to mention, the higher plans from OptinMonster would be pricier, even if they weren’t charging per year. This plan lets you install the plugin on one site. It also provides all the features offered through the Thrive Leads plugin. You get a year of support and unlimited updates. This plan lets you install the plugin on an unlimited amount of sites. 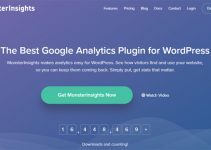 This plan lets you install the plugin on an unlimited amount of client sites. Although it’s a bummer for the buyers, it’s nice to see that Thrive is willing to state that the price will increase in the future. They say it’s because of the constant improvements that are bound to come along. The Thrive Themes company has a three-step process if you’re having a problem with one of your plugins or themes. They ask you to check out the tutorials section, then move onto searching for an answer in the large knowledge base if that doesn’t work for you. Thrive Leads is covered pretty extensively, so you can click on questions about display settings, animations, forms and lead groups. All of this is based on past questions that other users have asked the company. You also get some nice member documentation when downloading the actual plugin. If all else fails, the company asks you to write them a message in the support forum, where they’ll respond to you in a reasonable time frame. Keep in mind that Thrive doesn’t have a phone line for you to call, and you can’t open up a live chat module for quickly asking a few questions. You can try to reach out to them on social media, but that’s not always that reliable. We like the support system they have set up, and the documentation is just fine. However, it’d be nice if a live chat box were provided in the future, especially if they start charging more for the product. How Do We Feel Thrive Leads Compares with Key Competitors? Plugmatter is a solid choice, but it does require you to insert a line of code for it to work. That’s not the worst thing in the world, but it’s slightly more complex than Thrive Leads. The documentation is very strong with Plugmatter, but we like Thrive Leads a little more because the features are more powerful, considering Plugmatter only really has feature boxes. Magic Action Box is one of the more clunky solutions you can choose from. I’ve only played around with the free version, so you may have more luck if you paid for it. That said, I found it far more complicated to setup than any of the other competitors. OptinMonster continues to impress, but the customization tools aren’t quite up to the Thrive Leads standard. That said, it may catch up eventually. The big reason we like Thrive Leads over OptinMonster is because the pricing is slightly better with Thrive. You don’t necessarily have to pay for a yearly pass (besides the Agency Plan,) and all features are included with each plan. Since Thrive has several opt-in form styles packaged into the plugin, and the templates are so stunning, we would recommend this over most of the other competitors out there. If you’ve had a chance to play around with Thrive, let us know your thoughts in the comments below. Lifetime updates with every plan! Summary: Thrive Leads is certainly one of the best WordPress list building plugins out there. The easy to use drag and drop editor and a large library of predesigned templates gives you the ultimate customization and flexibility and will help you building your email lists without the need for special coding skills. this particularly great article on our website. Keep up the great writing. Thanks for sharing the thriveleads review. I really enjoyed reading your article. 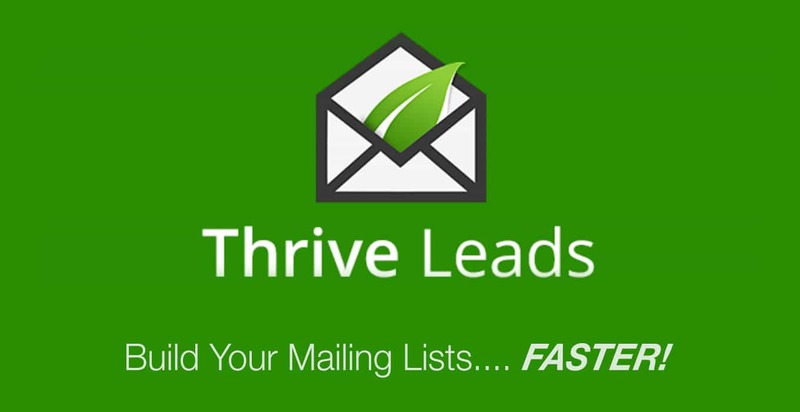 Be very, very careful before signing up with Thrive Leads. Their service leaves a LOT to be desired. They have no concept of customer service. Consider OptinMonster, LeadPages or SumoMe instead. Same functionality, lower price and you don’t have to deal with broken customer service. Sorry to hear you had a bad experience with Thrive Leads team. My experience has been totally different. I’ve been using Thrive for 2 years now and their support team has been excellent for me and any issues have been resolved within hours. 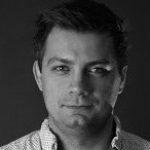 I also used previously OptinMonster, LeadPages and SumoMe and in my opinion, none of them come close to Thrive functionality – especially if you use their themes as well. Once your support period expires, they want to charge you to answer the most elementary questions. Even pre-sales questions. I was interested in buying a second license, so I asked which wordpress plugin they supported besides MailPoet. They refused to answer this question unless I pay them more money for their support. Unbelievable! These guys doesn’t care about their customers! Stay away from this company! BUYER BEWARE!